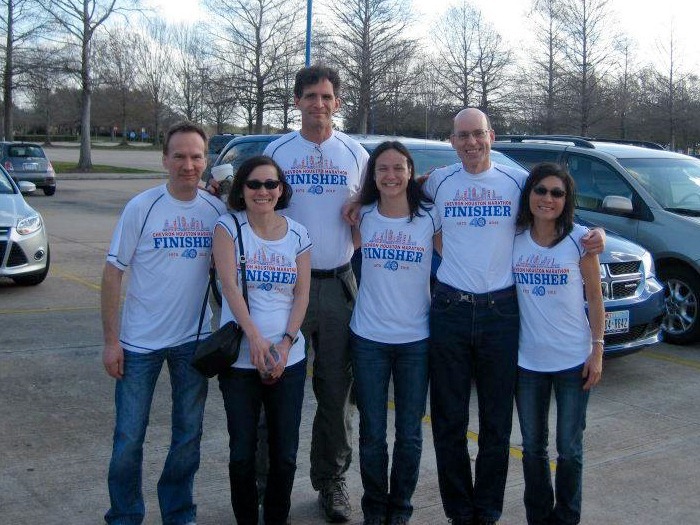 Last June, our friend Sue floated the idea of running the Houston Marathon as a group. 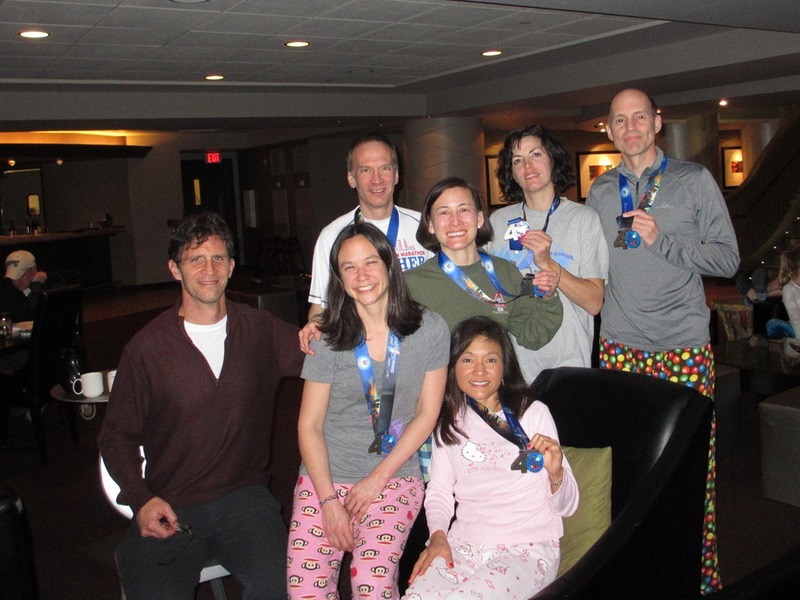 This was part of her plan to run twelve marathons in the twelve months of 2012. My first response was ‘meh’ – I’m not that crazy about large road marathons in general. 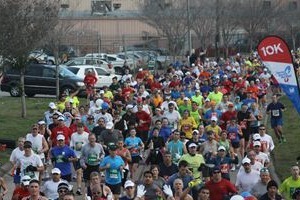 Running with thousands of others on the streets of Houston rather than picking a nice trail event didn’t sound like my cup of tea. But what initially piqued my interest was that the Olympic Marathon Trails were occurring the day before. 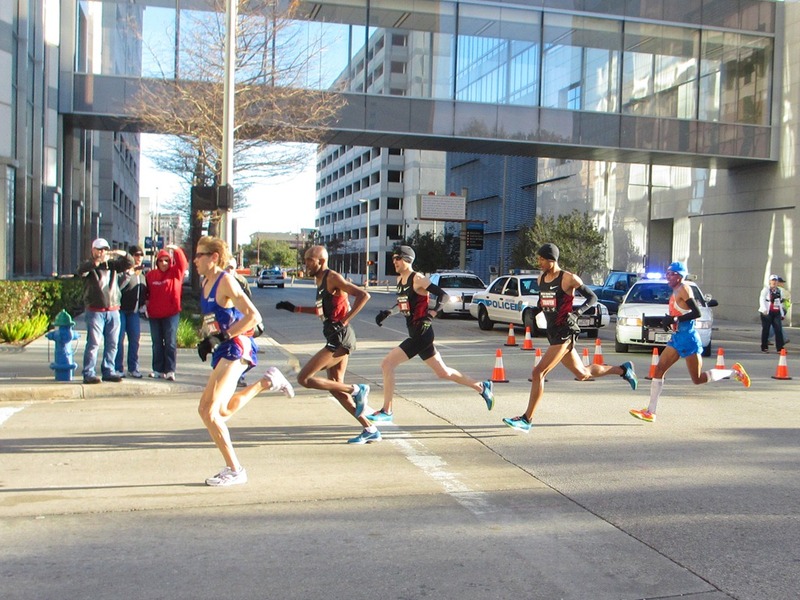 The opportunity to see elite marathoners vying for the six Olympic team slots sounded pretty great. And getting to do this with friends made it sound even better. So – I submitted my name into the lottery, along with Sue, and our friends Larissa, Ken, Dan, and Theresa. We entered the lottery as a team, so either we were all in, or all out. I figured I had nothing to lose. A couple of days later, we got word that we were in! Fast forward to last week. I’d had to revise my original travel plans to add a business trip in front of the vacation in Houston (never thought I’d say those three words together). The trip was to visit my undergraduate alma mater, Cal Poly in San Luis Obispo California. A great school, and a beautiful place too. One benefit was that I’d get to take a couple of runs in Poly Canyon, where I’d grown to love running in my mid twenties. So when I landed in SLO midday on Wednesday, I immediately donned my running shoes and headed out to the canyon. The plan was to do an easy 5 or 6 miles, and have some time to catch up with some professors, get something to eat, and do a talk for engineering students in the evening. Plenty of time. When I hit the canyon, I was hooked again. I wound several miles out, and rather than cut it off where I’d planned, I decided to try to do the full canyon loop. Thing is, it had been over twenty years since I’d last done that. And I missed a turn at the barn by a creek waaay out in the middle of nowhere. I might still be out there had I not happened upon a mountain biker who graciously directed me back to the campus, by way of Highway 1. Locals will recognize how lost I’d become – the 5-6 mile became 11. Usually getting bonus miles like this wouldn’t be a big deal – it was beautiful, fun, and I had time to do most of what I’d planned. 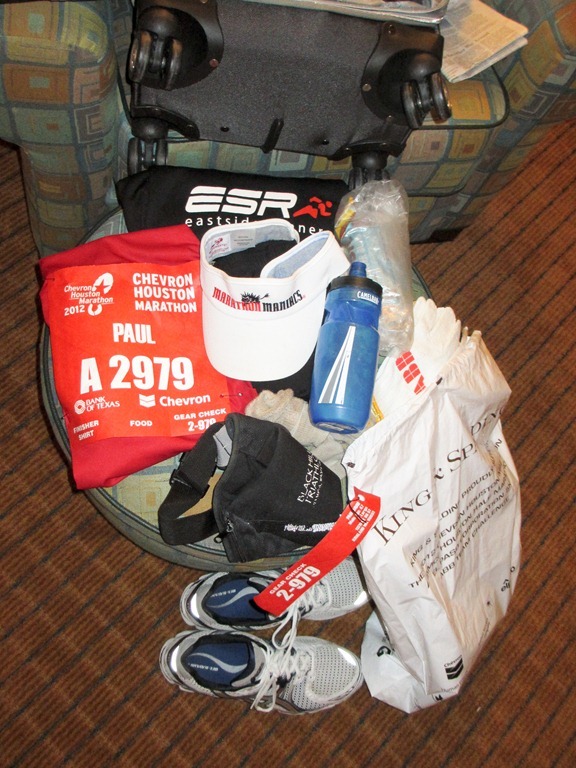 But I was on my way to Houston, to run a flat fast marathon course. And I didn’t need to chew up my quads by winding up and down the hills in Poly Canyon during my last bit of tapering. My legs were still pretty tired the next day. I couldn’t chance being miserable in Houston, so I didn’t do that second canyon run I’d planned. 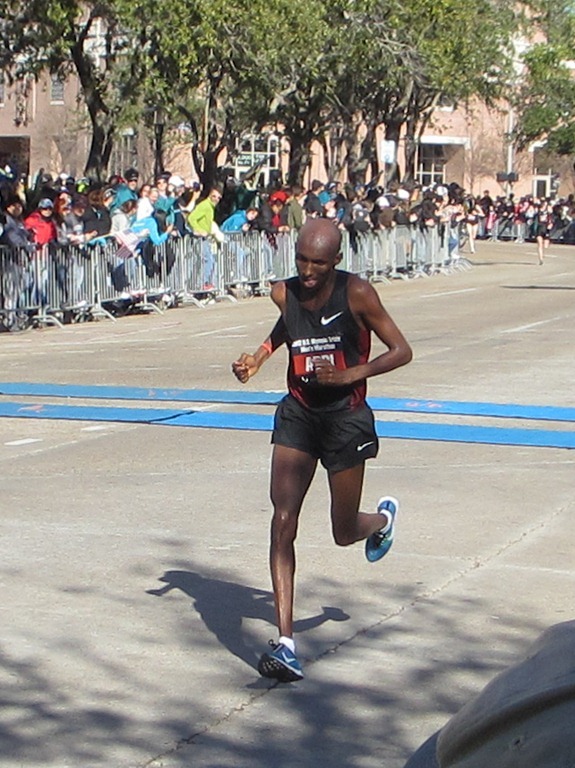 Instead I flew to Houston, and figured I’d do an easy 3 or so, with my standard three, minute-long accelerations to stretch my legs out two days before the race. The folks at the hotel directed me to the trails along the Buffalo Bayou, telling me that they went on a ways, and that they were pretty nice. I must have gone the wrong way, because what I found was a sandy asphalt trail winding along a shallow muddy trickle underneath a series of overpasses. No problem getting those accelerations in – I was just happy to be done. With the taper complete, all that’s left to do is to rest and refuel. And in this case, take in the Olympic Trials. 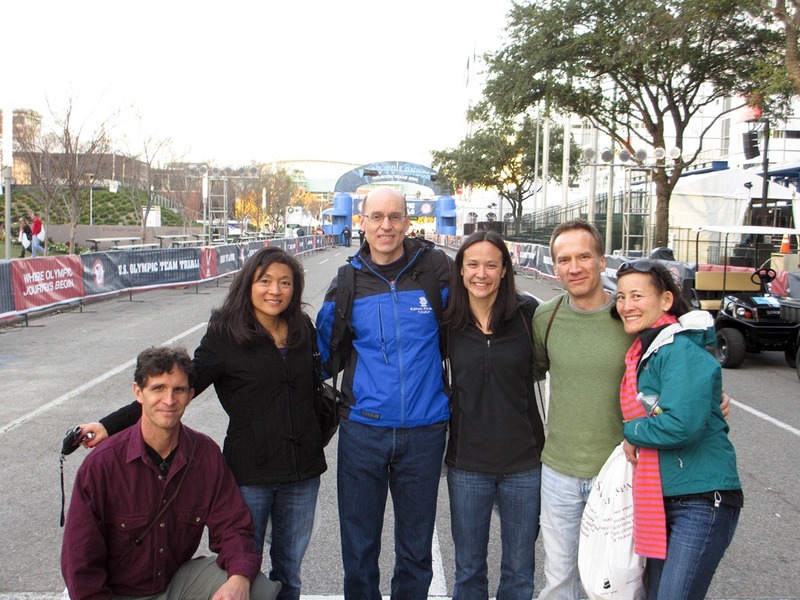 Our Eastside Runner crew sat down to take in the opening ceremonies. One of the highlights there was getting to meet some running legends. 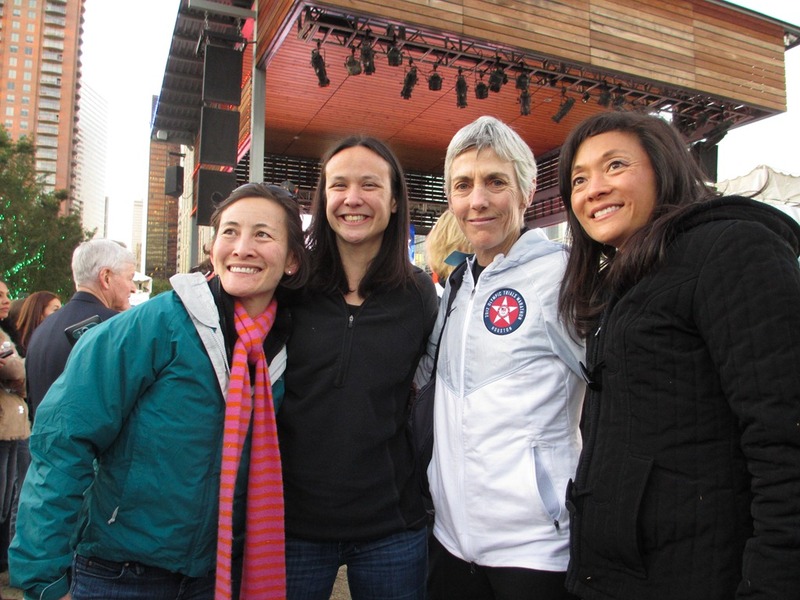 Joan Benoit Samuelson – the winner of the first Olympic women’s marathon in 1984 posed for a picture with Sue, Theresa, and Larissa. I got to shake hands with Frank Shorter, and spotted Bill Rodgers in the crowd as well. 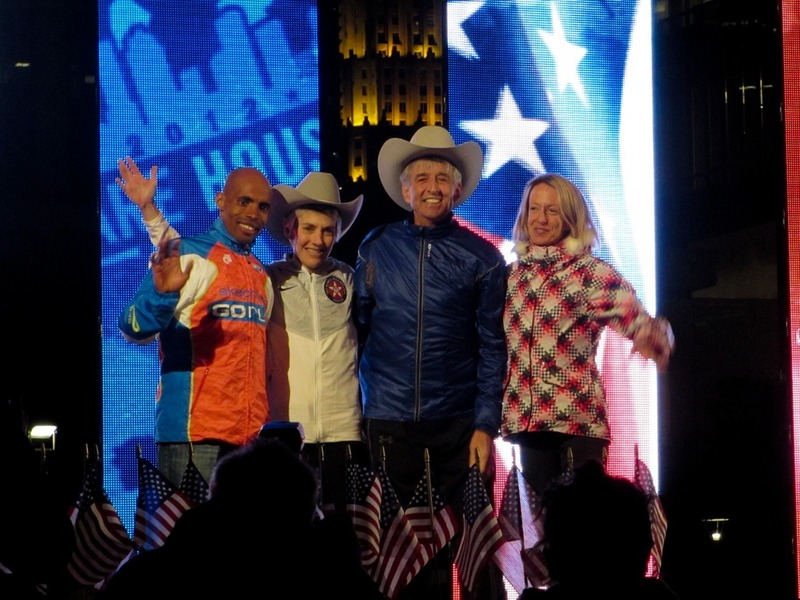 And it was incredible seeing the last four American Olympic medalists (Frank Shorter 1972/1976, Joan Benoit Samuelson 1984, Deena Kastor and Meb Keflezighi) all standing together on the stage. The trials were amazing. 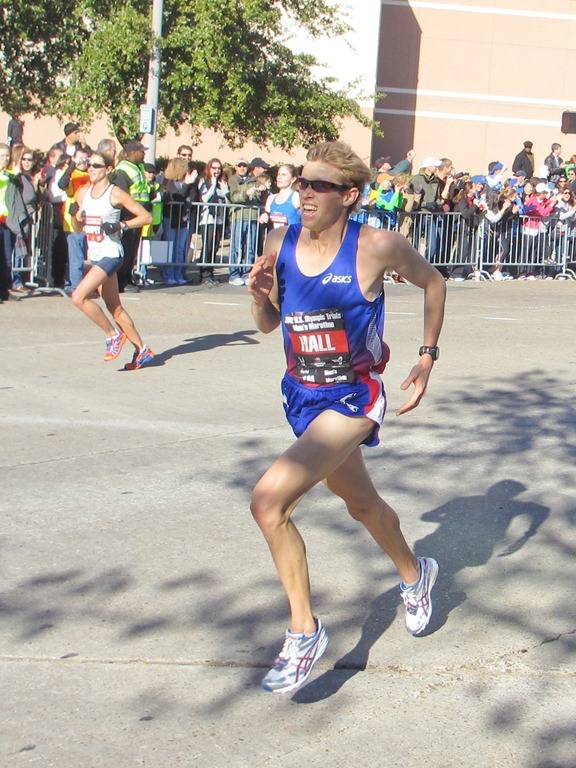 In the men’s race, as expected Ryan Hall pushed the pace hard, which separated the leaders pretty early. 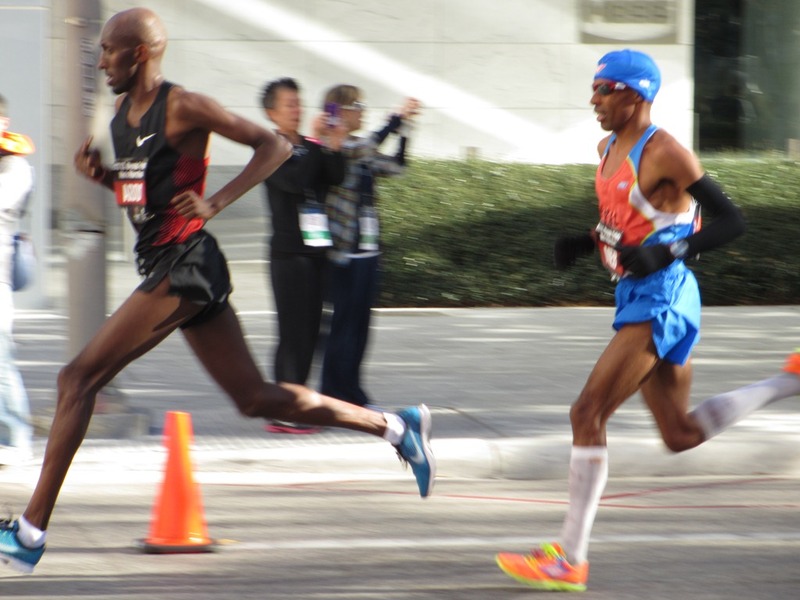 By the midpoint, it was a four person race with Meb Keflezighi, Ryan Hall, Abdi Abdirahman, and Dathan Ritzenhein made it a close one until the final loop. Ritz had fallen back bit from the three others, while Abdi was hurting but holding in third. 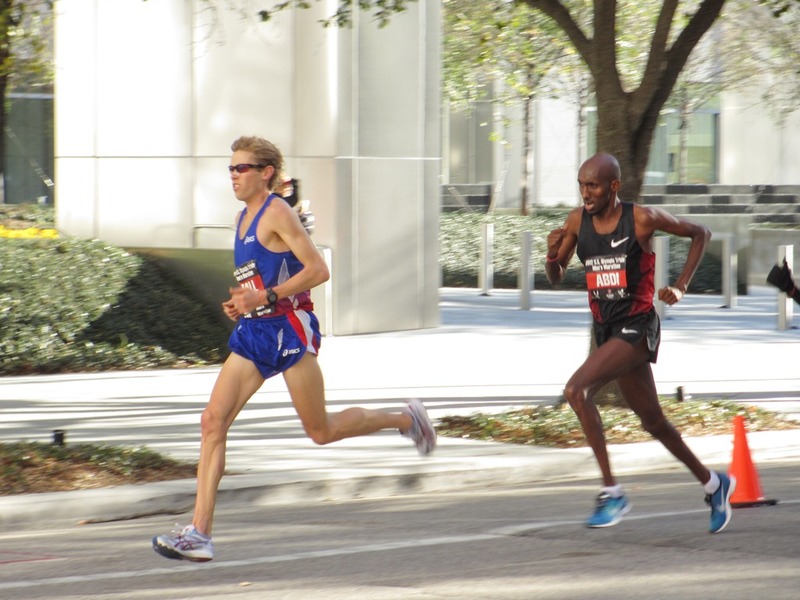 At mile 24 Meb took the lead from Ryan, and ran home. Ritz made it close with Abdi, but simply ran out of course. 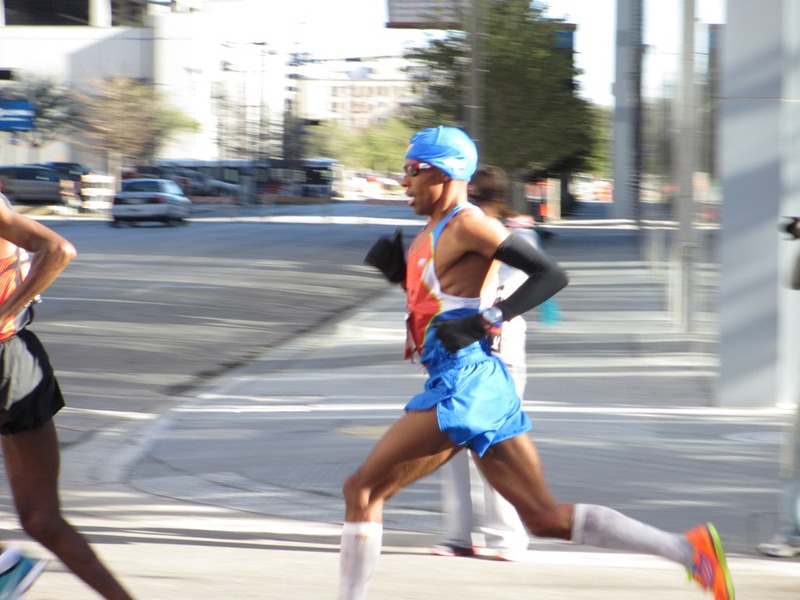 I’ve long admired Meb – and seeing him win this was great. 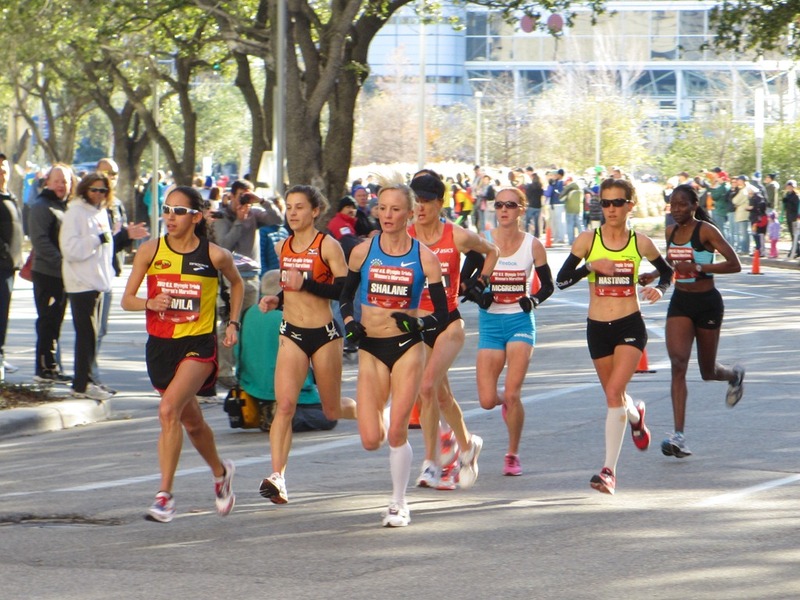 The women’s race was also an excellent one. 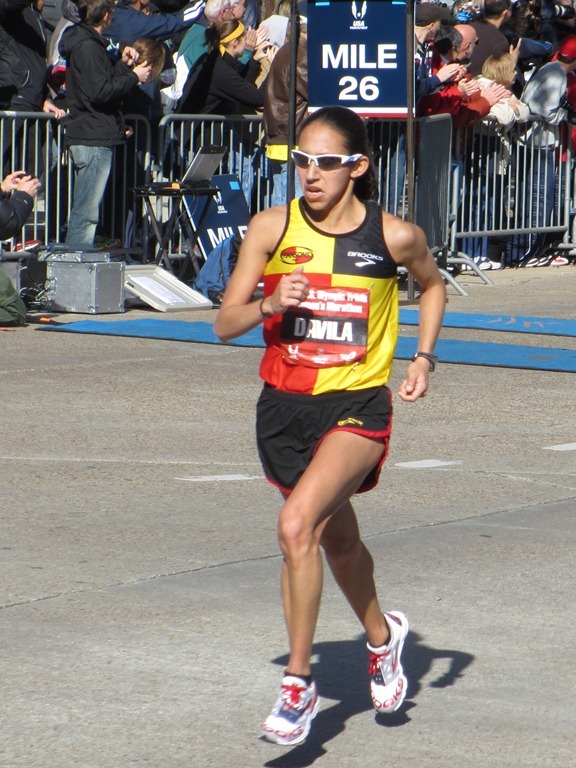 Desiree Davila took the lead early, although kept a more conservative pace – allowing the women to speed up as they went. 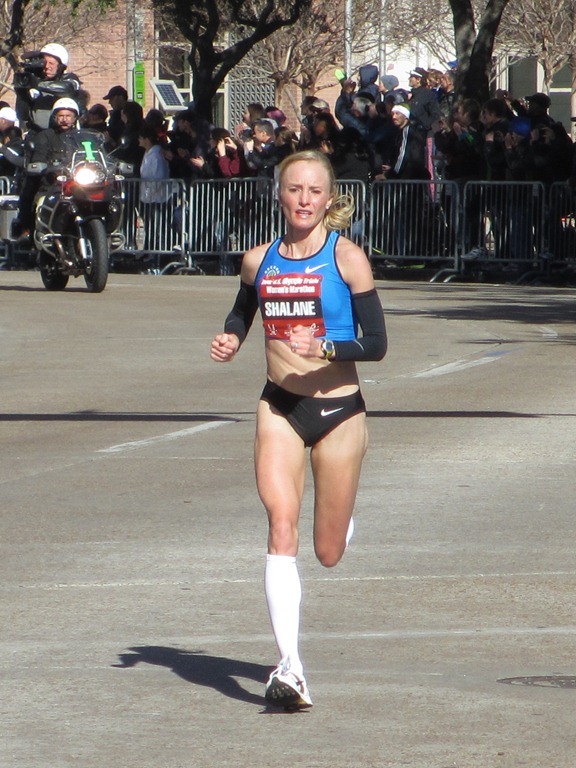 Shalane Flanagan held close much of the way, taking the lead later in the race. 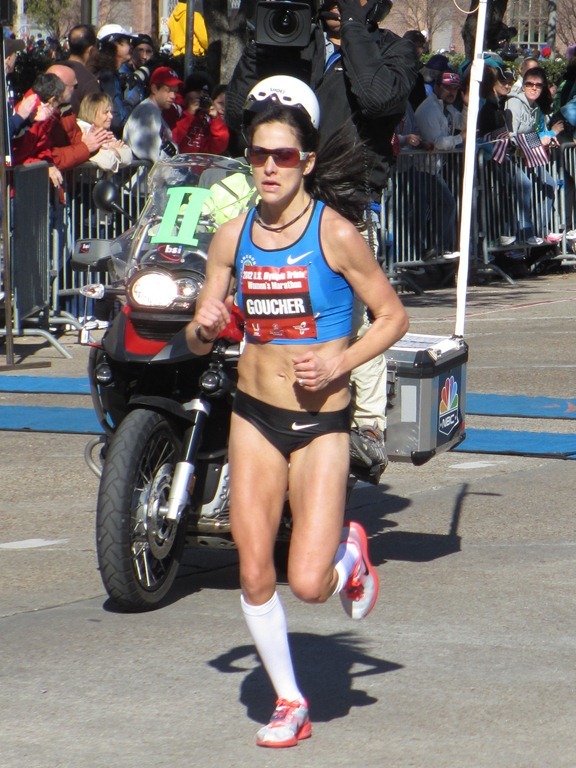 Kara Goucher and Amy Hastings hung with the leaders, but letting the others set the pace. 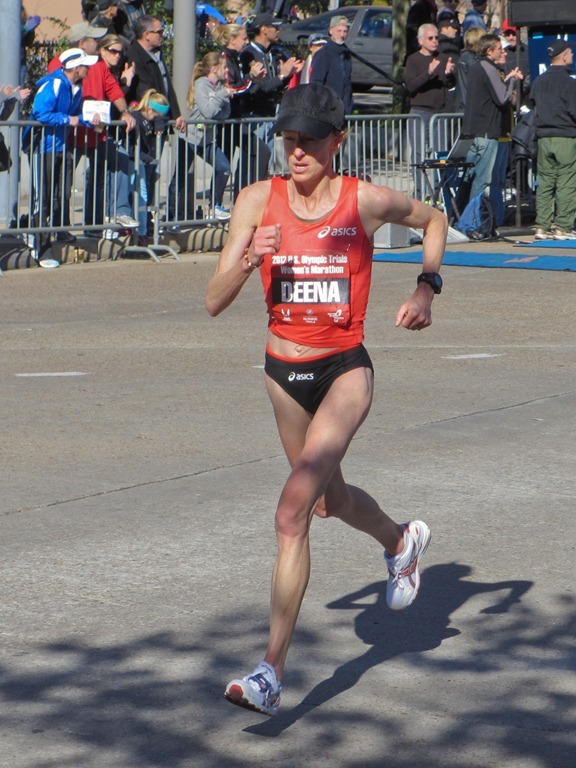 And one of my favorites – Deena Kastor, ran with the lead pack until later in the race. 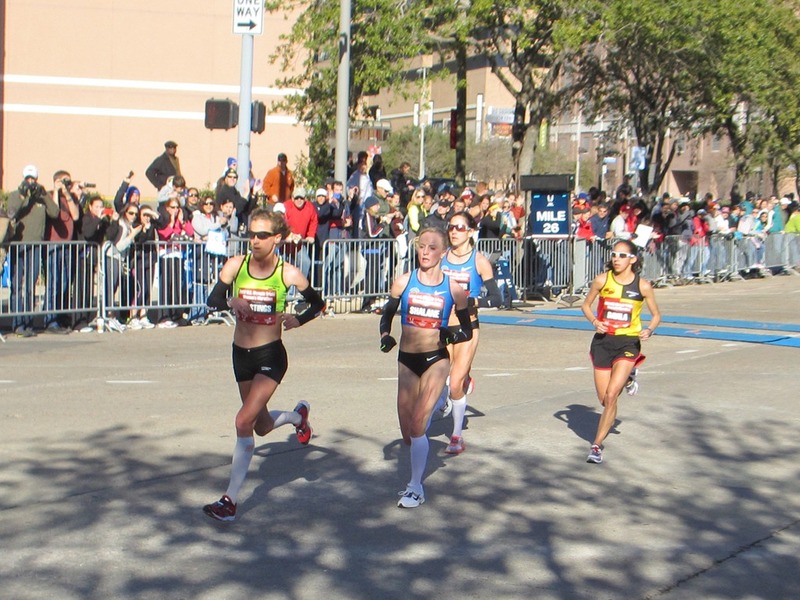 At mile 18 Amy took the lead but couldn’t hold it – gutsy move! She dropped back a bit, which left the lead pack of Shalane, Desi, and Kara to finish in that order. Having the opportunity to see legends and truly elite competitors live and up close was an amazing experience. They make running marathons look easy, basically gliding along. But we know that’s really the product of focus, determination, and lots of hard work. Race morning didn’t start out so well for me. I’d slept well, but my stomach was a bit off. I wasn’t sure whether this would be a race interrupted for some mandatory stops. I taxied to the starting area, and joined the Marathon Maniac group picture, then made the rounds of the porta-potties trying to find my “happy place”. At 7 am, the gun went off, and I began my thirty-fifth marathon. My race plan was pretty simple. I wanted to try to keep under about a nine-minute per mile pace and see how things went from there. 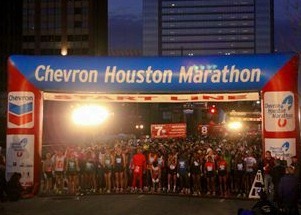 Prior to Houston, my previous three marathons had all been under 3:45. 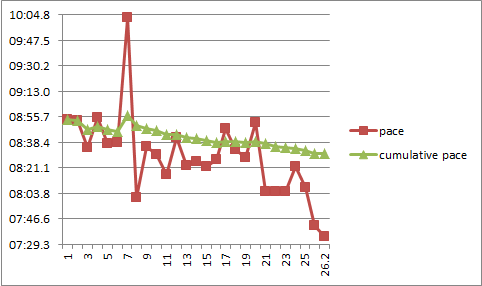 Based on my poor taper, and how I felt that day, I wasn’t confident I’d be able to continue the streak. So I plodded along at a modest pace, just under 9 min/mile. My heart rate started out a bit high, but settled down after the first mile. The course over this stretch took us along a rather full section of highway, and then dropped us into some neighborhoods. Once we were there, the crowds remained pretty constant for the duration. I was nice being able to draw some good energy from the people shouting out to us. The bibs had our names, and I’m not really used to that. This meant I’d hear people calling out my name to encourage me – and inevitably my brain wouid react as if it were supposed to know them. The effect was odd – each time I’d begin to drift off into marathon-zombieland, I’d get awakened with some kind words of support. My stomach still wasn’t right, so I made a stop just after the six mile marker. There’s no delicate way to say this – I had to decide whether this would be a longer or shorter break. I took the chance that taking the shorter break for now, might be enough to settle things down. Surprisingly this seemed to work, although that wasn’t clear for another couple of miles. By then, I’d caught up to Larissa and Theresa as we headed south on Montrose. I said hello, but kind of hung back, unsure whether I’d be up for talking much. And so we continued past Rice University, past some really nice houses, and more neighborhoods. By then I’d noticed that paradoxically, my pace was pretty good even though I still didn’t feel 100%. My spplits were regularly under 8:30 with my heart rate steadily in the mid 140s. If my legs and heart weren’t lying, and my stomach was okay, I could have a pretty good day. And so it went – between mile markers 8 and 18, I averaged a nice 8:27 min/mile pace. I’d was beginning to feel tired, but just as I gave myself permission to ease up a bit, Theresa ran up next to me and told me that I was going to pace her to a new PR. Theresa’s lead-up to the race was interesting. She’d been really busy with work, and had run about once per week for a while – essentially just doing her long weekend runs. Not a conventional training program, but given her health, strength and determination it was working. And although she refused to say so (not wanting to jinx it) – she was running a good pace, and feeling good too. At mile marker 21, I looked at my watch and noticed that we’d just done an 8:05 mile. Wary of overdoing things, I told Theresa that I planned to slow down to closer to a 9 min/mile pace for a while. My hams and calves were hinting that they might cramp. I told her that she should feel free to continue on. But that’s not how it worked. Through mile 23 we continued to be close to eight minute miles. And then after a slower mile 23-24 (8:22), we went back to 8:07. I knew that if we held steady, we’d be in under 3:45 – ample for a new PR for Theresa. By now we were heading back into downtown on the Allen Parkway. I didn’t notice at the time, but we’d had a slight downhill grade until about mile 25 – so I’m pretty sure that helped too. As we hit the 25 mile marker we entered downtown. 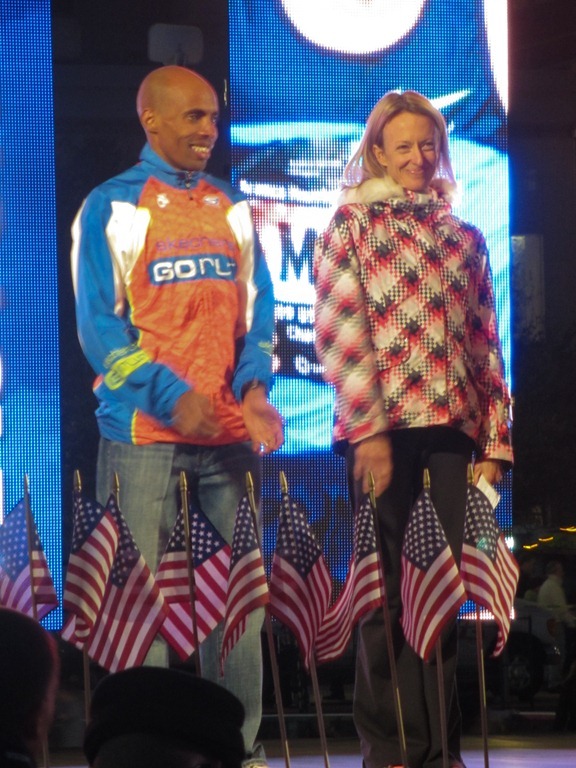 Running on the same streets we’d seen Meb and Shalane lead the way the day before was like running with a nice tailwind. Unbelievably we did our best mile all day then – hitting a 7:42 pace. Making the turn for the final quarter we actually sped up a little. We crossed the line just under 3:43. Wow. One of the things I love about running is the way we can surprise ourselves. Watching Theresa take in that she’d just run a 15 minute PR made my day. And thinking about how I’d been able to crank things up at the end made me feel very good about my own race. By the time Theresa and I finished, Dan had time for a nap (he cmae in at 3:05). We’d seen him just before the last turn cheering us on – just the boost we needed to dig deep. I finished just ahead of Theresa, but it turns out she’d spotted me some time at the beginning – so she beat me in by about seven seconds. Our friend Kathleen came in at 3:51 – sounds like some IT band issues hit her in the late miles. Larissa felt the warmer than usual temperatures in the late miles, but finished strong in 3:54, just ahead of Sue and Ken. 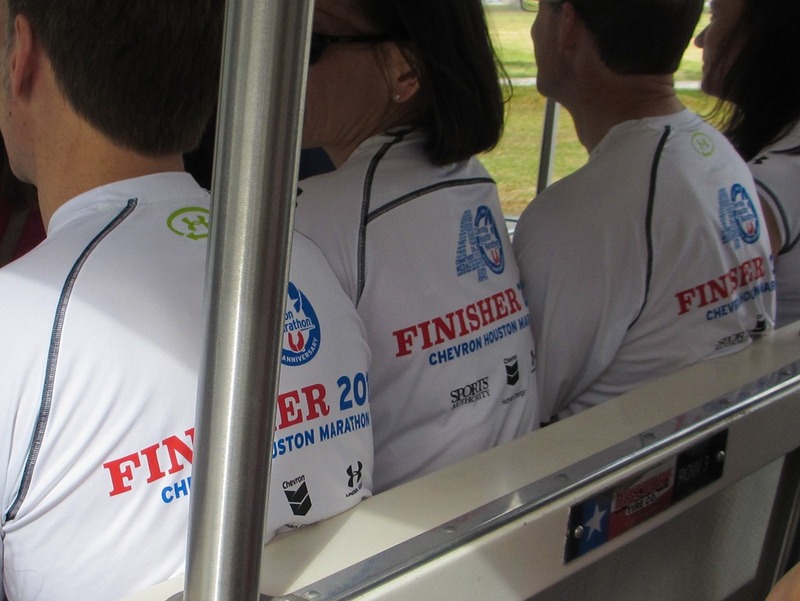 We walked a bit stiffly in to collect our finisher shirts and eat some food. 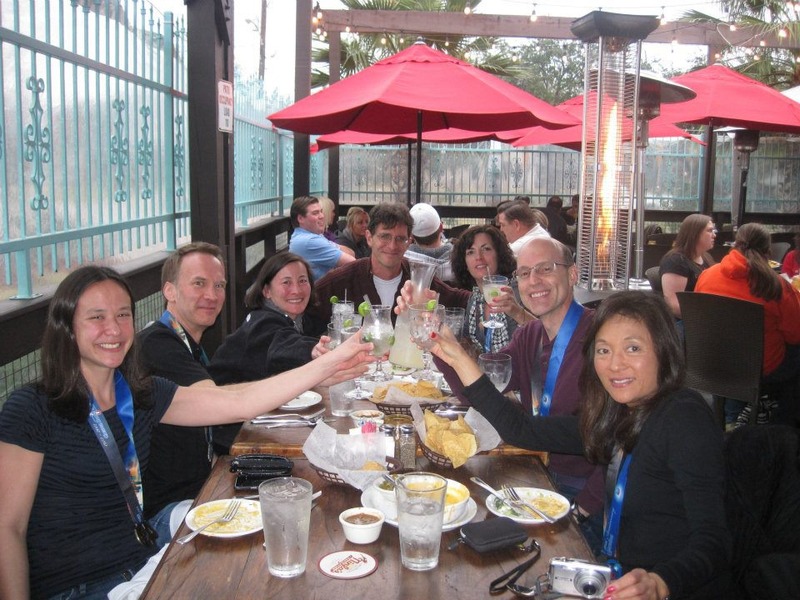 That evening, we celebrated over some great Mexican food, complete with margaritas. 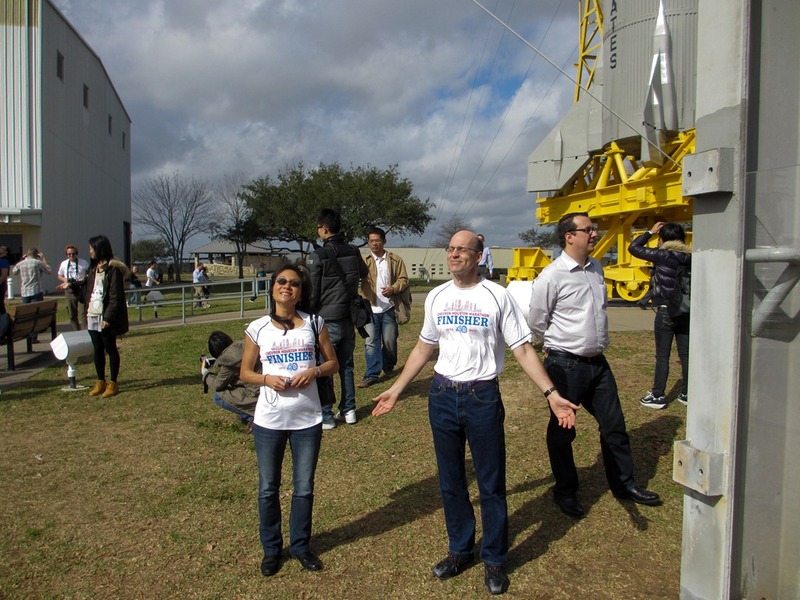 The next day was a fun tour of the Johnson Space Center, outside Houston. Getting to see the Mercury Redstone and Saturn V rockets, see the simulators, and visit Mission Control was a kick. All in all a very nice trip. A small part of that was being pleased with my race. The bigger reason is that taking it all in with friends. Some of these pictures were provided by Larissa Uchiyama and Theresa Novillo – permission for use is pending. The charts tell the story pretty well. I enjoyed a five minute negative split, powered by a decreasing average pace. Fastest splits were at the end. This is the way it’s supposed to be. Thing is – if I claimed I’d done it on purpose, I’d be lying. 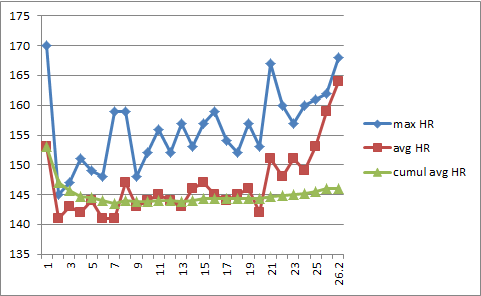 My heart rate averages trended up slightly, more significantly when we pushed the pace to sub-8 min/mile. Definitely a good day for running. This week I had the opportunity to run in the place I first began to love running. For me, this happened in my early twenties, when I was getting my undergraduate degree at Cal Poly in San Luis Obispo, California. One quarter I decided to take a running class, figuring I could use the exercise. We started out by running a mile or two around the track. I clocked in as just about the slowest runner in the class. 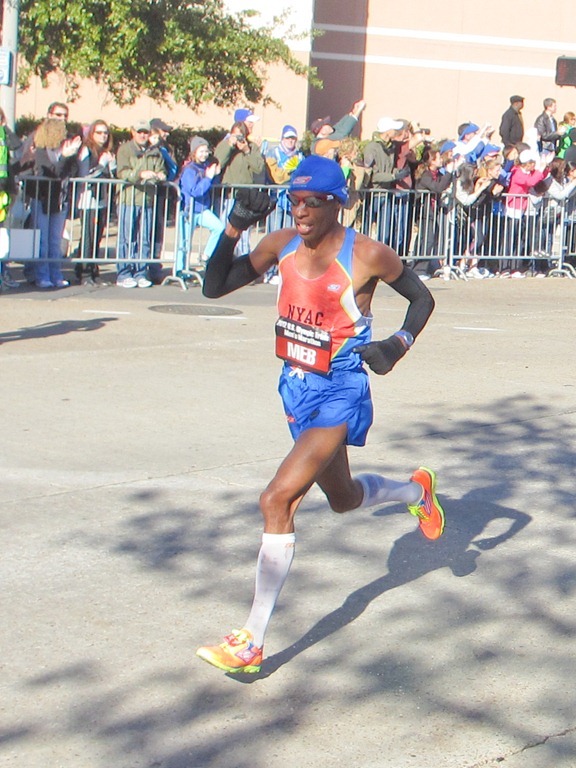 It felt a bit discouraging – after all I was going as fast as I could muster. And I was still being left in the dust. Several weeks into the class, we started running out along a dirt road that led to Poly Canyon, northeast of the campus. It was about a mile to the end of the road, and began using how I felt on this out and back route to gauge how I was doing. I’m pretty sure that I was still the slowest at the end of the quarter, but I felt more confident. I began employing some mind tricks to keep myself focused on whatever my goal pace or distance was. I didn’t let myself think about what I’d do when I finished – figuring that was just getting ahead of myself. I told myself that if I could complete a fast mile, I could use the same focusing techniques to earn an A in one of the tougher classes. By then, I’d noticed that there was something about doing this running thing that I kind of liked. Later that year, I ran my first 5k, also out along Poly Canyon Road. 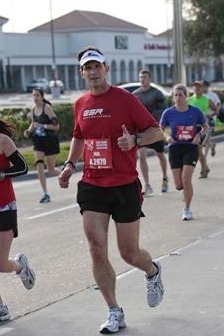 I remember feeling good about running the whole way, and even passed some folks who had gone out too fast. The race took us into Poly Canyon itself, along a single track trail, before turning us around and heading back to the finish in front of the gym. I will never forget how it felt the first time I came across a finish line. 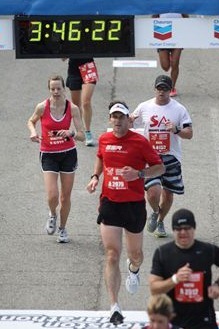 I pushed myself harder approaching the finish and hearing the small crowd gathered there. Running in and feeling the energy was amazing to me. I started running farther out along the trail, making it 3.5, then 5 miles. There’s a nice stretch where you climb around 500 feet, coming to a ridge. The first time I made it up the hill without stopping, I was struck at how great it was to turn around and see such a clear sense of progress. Looking down the hill I’d just climbed I could see the trail winding through the switchbacks,. One day I completed the entire 8.2 mile loop through the canyon, running up hills, past cattle and horses, and catching the views of the seven sisters – the string of volcanic peaks that extend from San Luis Obispo’s Bishop’s Peak all the way up to Morro rock. I was soooo tired, but truly amazed at how I’d earned the views along the way. That’s about the time I started thinking that anything was possible if I put my mind to it. So when I was back at the University on business this week, I managed to fit in a run into the canyon for old time’s sake. More of the land along the road and along the return to the campus has been developed, but Poly Canyon is still amazing. 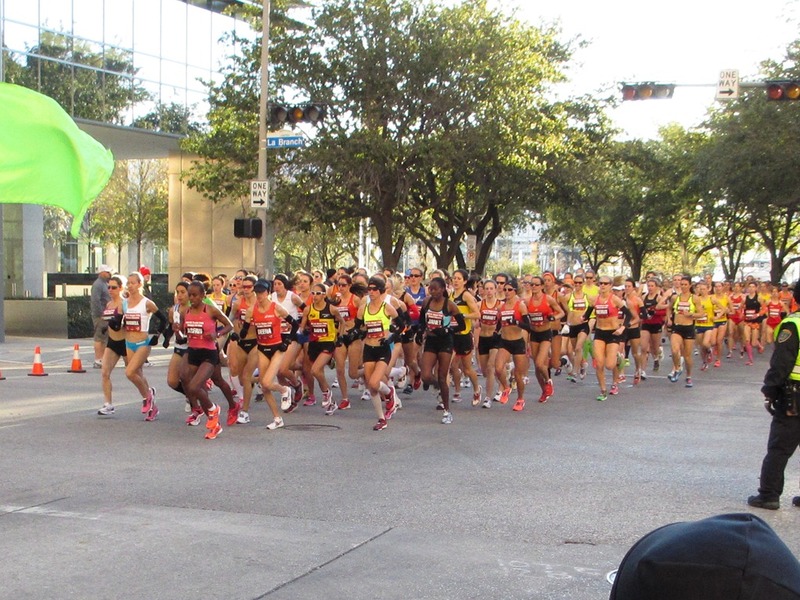 I’m writing this as I travel to Houston, to run a marathon this coming weekend. I’ll definitely carry the spirit I rediscovered with me there. As an aside, I did learn a good lesson running in the canyon this week. After twenty years, you might forget a bit of the course. I took a wrong turn crossing a creek about 4 miles out, and might still have been out there had I not encountered a helpful mountain biker who directed me back to the campus. So my easy five miler turned into a more difficult eleven miler. But there’s a reason I’d call them “bonus miles”.